« Expanding on History, Part 2! 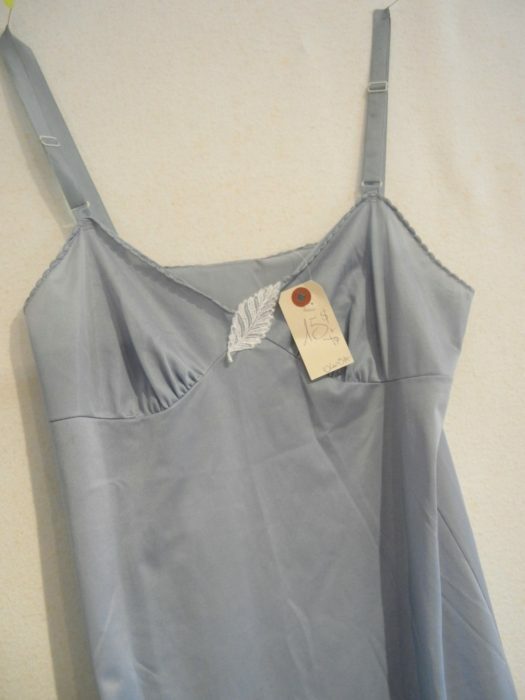 So when I found a blue slip in a Montreal vintage clothing store, and the price was right, I had my beginning. Was about to combine it in a patchwork of blue rectangles, but the outcome would have lacked color contrast and aesthetic interest. 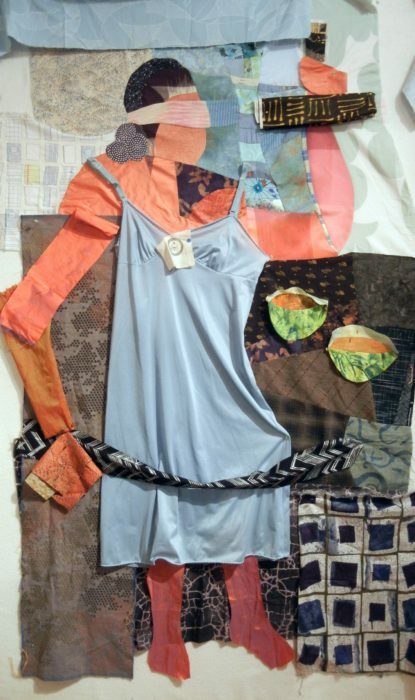 I couldn’t reconcile the actual undergarment with a geometric abstract. Next Eureka moment happened when my friend Barbara said, “Why not have Lady Liberty wearing the blue slip?” Which coalesced with my subject matter as my friend Sammie remarked that, “If anyone would wear a blue slip, it would be Lady Justice.” Bingo. 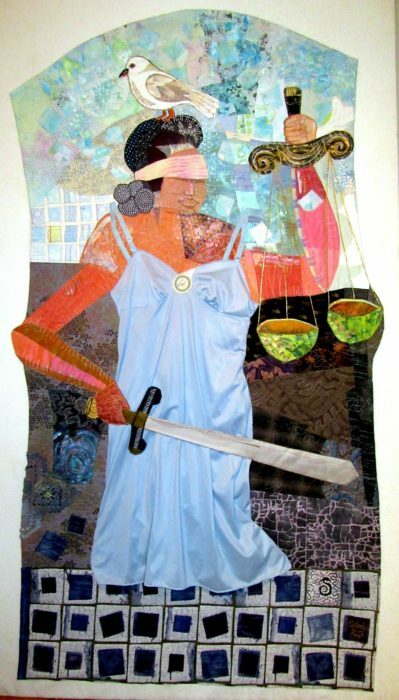 I happened to have made a figurative block, and I sliced into the face to insert a blind-fold, and made the bowls for her scales of justice. I probably could have (should have?) stopped there, but I felt the viewer would need some more visual clues. 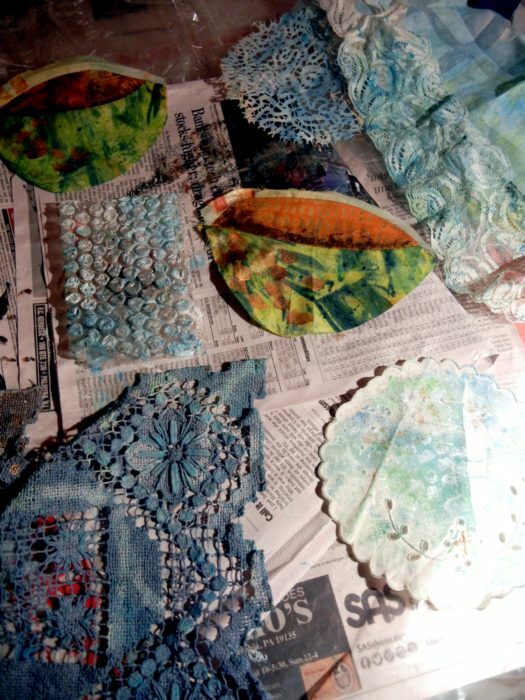 To integrate various areas into the piece, I did some painting, dabbing, and printing on vintage doilies and lace. 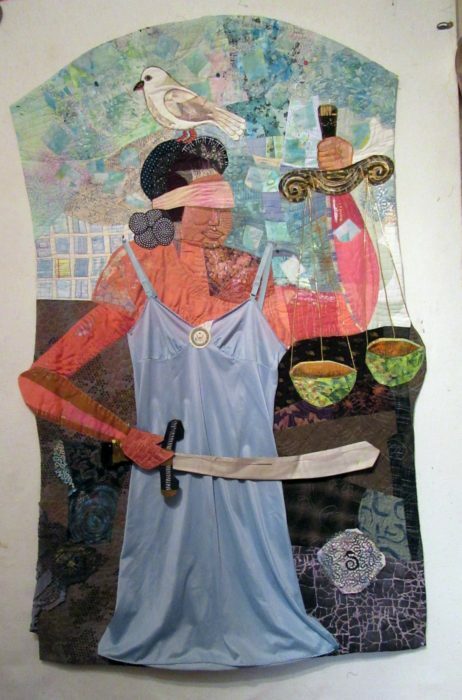 I used applique and piecing to collage various fabrics into a cohesive background. 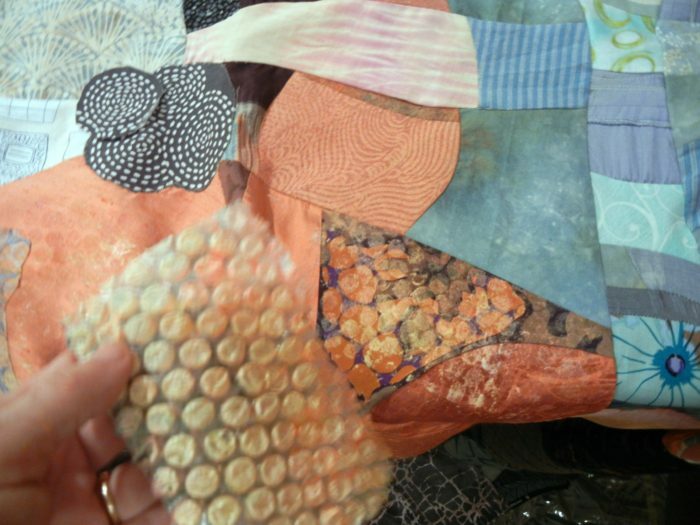 Next, I got to work with my new midarm machine, quilting each area down. 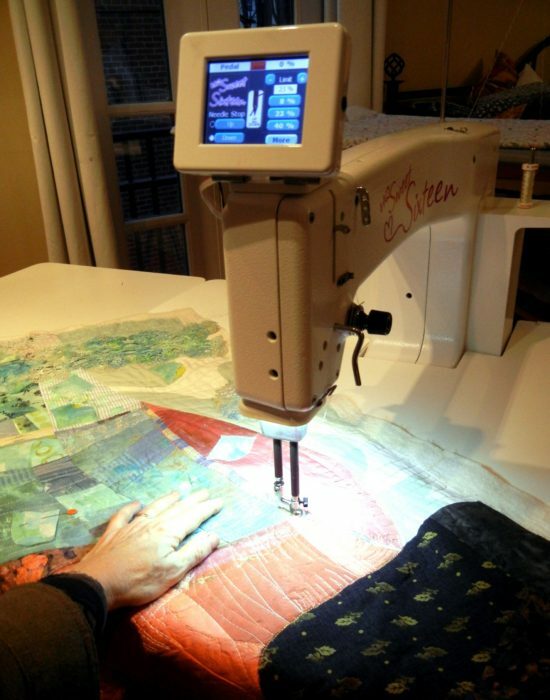 That was a steep, but enriching learning curve…with days spent futzing with the machine, adjusting the tension with each new thread, and coming up with different quilting patterns for each section. Note the blue slips swirling in the background. 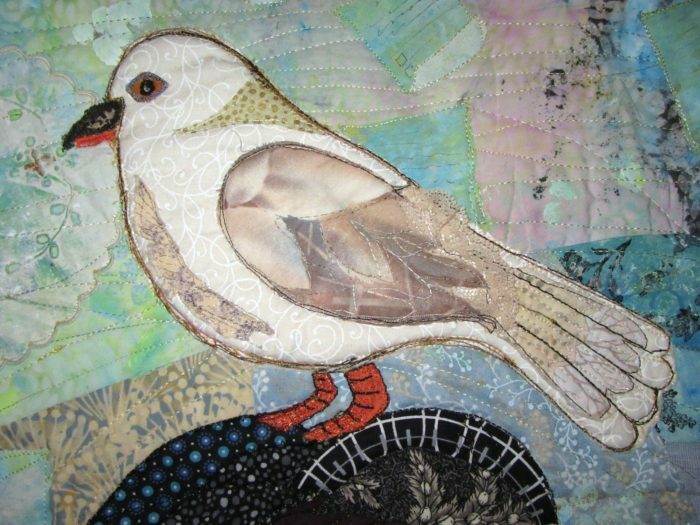 I intended to crop the top of the quilt, but couldn’t bear to do that, so I filled the extra space with a bird, like so many that perch on statues. It’s a mourning dove, which symbolizes both the desired peace of a fair, bipartisan process, and also the grieving that came when judiciary committee chairman Grassley abandoned the blue slip process, to move ahead with the nomination of two men who were unacceptable to their home-state senators. Another vintage item, a sliver of a silver tie that my grandfather wore, became Lady Justice’s sword. 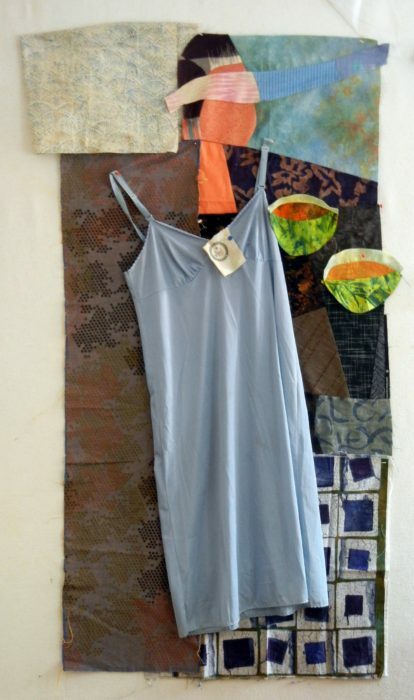 I expected the piece to end at the hem of the slip, but the effect was truncated, off-balance. Earlier, I had auditioned feet emerging from the slip, but they just didn’t stand up to the rest. I wanted to suggest a pedestal base, and after auditioning multiple fabrics, I settled on an early choice–see my first draft second photo from the top. 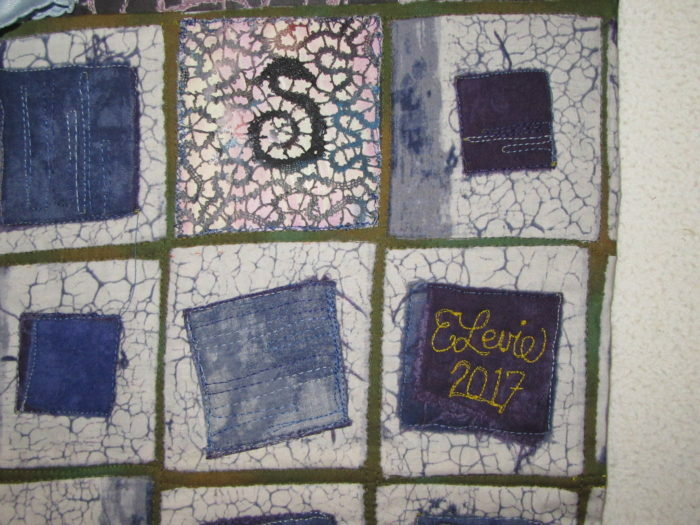 I altered this batik look-alike, quilting suggestive lines of type on all squares except for two: One sports a doily, it’s S-shape center motif alluding to the serpent at Justice’s heels. And one provides a space for my signature and date. The finished piece is larger than I intended…As tall as I am. And less expressionistic than I wanted. Yup, that actual blue slip gave abstraction the slip. But it’s done!…which is always better than perfect. 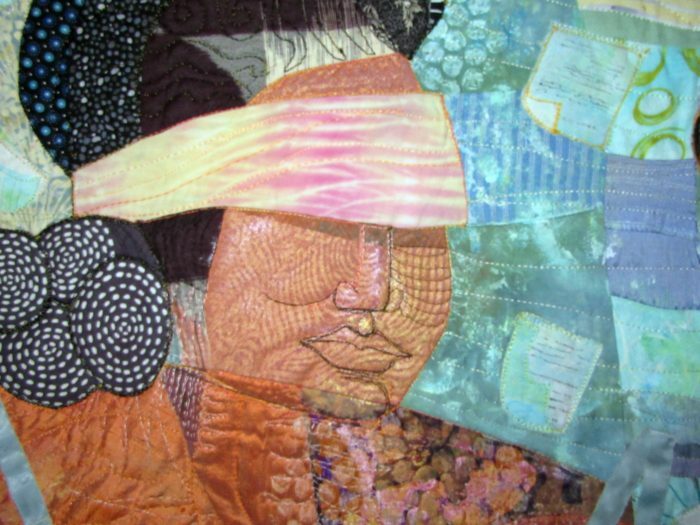 This entry was posted on Thursday, December 21st, 2017 at 8:53 pm	and is filed under Antique & Vintage, Art + Quilt, Personally Speaking, Statement Art, Unusual Materials. You can follow any responses to this entry through the RSS 2.0 feed. You can leave a response, or trackback from your own site. Wow! What a great story, great quilt – I’d love to see it in person – When I first saw the photo, I didn’t really think about the fact that it’s as big as a person! I hope this quilt gets seen by many people.